I came across a simple science experiment for the girls, that went perfectly with our reading of Henrietta Bancrof and Richard G. Van Gelder's Stage One, Read-and-Find-Out Science book, Animals in Winter. 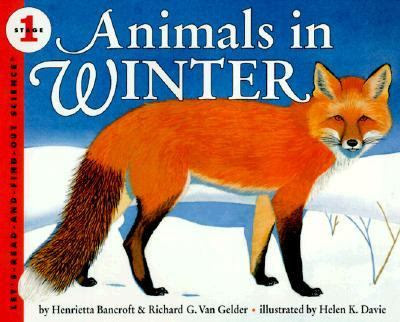 The book details, briefly, what happens to various animals in the winter, and what they do to survive, and find food. It ends with several suggestions for making bird feeders, or peanut, and berry garlands for the birds, and other small animals. One of the suggestions it gives, is mounting a flat board, with drainage holes, on a fence, or post, to place bird seed on. I asked the girls if they knew why the board would need drainage holes. They weren't sure. So, I asked them what happens when the snow starts to melt in the sun, and then freezes, as the temperature drops. Our temperatures shot up last week, melting some of the snow, and then plummeted yesterday, encasing the world in ice, so they knew the answer to that one. I showed them what happens to birdseed, when it sits in a puddle of water, and then freezes, and why that isn't good for the birds. First I gave them each a tweezer, for bird beaks. Then, I gave them a pan with bird seed just sitting in it. They used the tweezers to pick up the seeds, and move them to another pan. Finally, I gave them a pan with birdseed frozen in a shallow layer of water, and asked them to use the tweezers to pick the seeds out of the ice. They discovered it was much harder to get the seeds. They had to "peck" them free, before they could lift them out. Later today, when we're ready to face the cold, I'll have the girls add some birdseed to the bird feeder on our back fence. I found the idea for this activity on the Hummingbird Educational Resources' penguin page, where there are numerous penguin, arctic, and winter crafts, and projects for children. Neat experiment. We did an activity once on all the types of bird beaks...the shapes. We used tweezers for the seed-eaters. They had a lot of fun with it, picking up the various items with various types of instruments. Perfect timing when we start up our science book again we're going to get back into birds and such. My kids would enjoy that. What a great way to illustrate the challenges that animals face in this season! We are fascinated with birds and love to feed them in the winter! Awesome lesson! I think Anna will enjoy this one as well, and the book looks great too. Thanks for the link to winter activities site, it's pretty neat! This is very cool. We have that book; I have to look for it. Our snow is melting today - it's almost 60 degrees!!!!!!! Crazy.